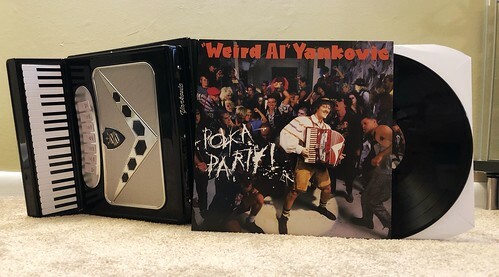 Over the next several weeks, we're going to celebrate Weird Al Wednesday as I go through each of the 15 albums in the Squeeze Box accordion box set. There are many albums in this set that were hugely influential to me as a young kid and there are no shortage of incredible songs throughout. Weird Al and The Blues Brothers are definitely the building blocks for my earliest appreciation of music. Polka Party! was the first 'new' Weird Al record that I remember. This was his newest thing and it was being actively promoted unlike the others, which I had just sort of stumbled across in the Jamesway cassette section while looking for his records. Polka Party is the album that seems to have slowed down Al's momentum and perhaps made it look like his 'one-hit wonder' time was finally up. From what I've read and heard, this album didn't sell all that well and didn't spawn a big single. In interviews Al has said it wasn't even a record he wanted to put out right at that point and it was pretty rushed and forced out due to record label pressure. Now I personally don't understand any of that. I love this album and always have. "Living With A Hernia" is an outstanding send up of James Brown's "Living in America." This is one of those songs that made me notice that Al was a really smart dude with the way he wove all of the different types of hernia names into the call back section towards the end of the song. This album also has the Talking Heads pastiche "Dog Eat Dog," a song that still pops up on his live sets. While "Addicted to Spuds" is certainly silly, I have still always enjoyed the potato puns over Robert Palmers's biggest hit. The polka medley, which is the title track this time out, is as great as ever blending together hits of the era like "Sledgehammer," "Sussudio" and "Rock Me Amadeus." I will say that "Toothless People" is probably the song of this era of Weird Al that I like the least. To this day I don't think I've ever heard the original and have no desire to. Luckily the album closes out strong with the hilarious country style original "Good Enough for Now" and Al's Phil Spector inspired "Christmas at Ground Zero." Due to the phrase Ground Zero having a much different meaning today than it did in 1986, this one doesn't end up on a lot of Christmas playlists anymore, but it's still a great song with its crazy contrast of incredibly dark lyrics and super cheery music. Polka Party! is probably one of the most overlooked albums in Al's discography, but if it's one you're not as familiar with, it's definitely worth giving another shot.